But many people find that they have to change their car battery every 1 to 2 years. And what can you do to prolong your car’s battery life? Well… That’s what we’ll discuss in this article. We’ll show you why car batteries die early …and what you can do to prevent this from happening. We’ll also give you 8 simple tips and tricks to maximize the lifespan of your car’s 12 volt battery. The tips we’ll teach you in this article will be simple to do …and anybody will be able to do these (even if you know nothing about cars or car batteries). First, every car battery has a limit to its lifespan. Even if you take care of your car battery perfectly …it will still die one day. This set lifespan is called the battery’s “Calendar Life” and it’s completely independent of how many times the battery has been charged or discharged. Once a battery reaches the end of its “Calendar Life” it will become unusable. Instead, they die early because of poor maintenance and care …which you can do something about. Lead acid batteries are the oldest, most dependable, and most widely used type of rechargeable battery in the world. Lead Acid Batteries have three life phases – formatting, peak, and decline. Formatting is when the battery is new and needs to be used gently. Peak is the ideal performance phase, which we seek to maintain for as long as possible. Decline is a slow process, but one that gradually ends in the termination of the battery. Batteries in decline can still be used for quite a while, but must be watched. Around this time, you can either recondition the battery or keep a close eye on it and try to replace it before a problem arises (like being unable to start your car for work). 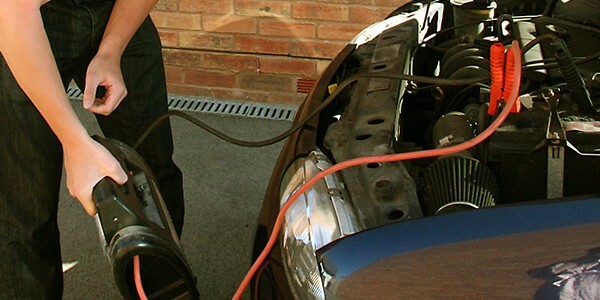 One of the first problems most people have with their car battery is the build-up of corrosion around the terminals. 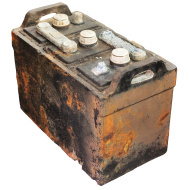 Corrosion destroys the connection between the battery and the vehicle and many batteries are replaced due to too much corrosive build up. But often times, this can be easily treated by simply pouring a small amount of Cola or a DIY anti-corrosion paste (one part water to three parts baking soda) over the corroded areas. The acid in the Cola or the alkaline properties in the DIY anti-corrosion paste will eat the corrosion away. After the corrosion is gone, use a clean damp rag or sponge to clean up the remaining residue and moisture. Be sure to let it dry, then rub some petroleum jelly on the terminals to prevent future corrosion. *note: see our safety tips at the end of this article before disconnecting/re-connecting your battery. When the car is on, the car alternator generates electricity and charges the car battery after the battery has a voltage drop. But if the car is not on, and you are using the car’s electronics, you are just relying on the car battery to power those electronics. This is detrimental to the car battery because car batteries are not meant for this type of use. 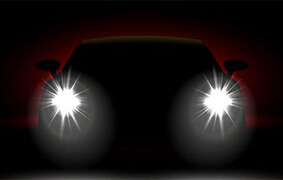 Instead, car batteries are meant to provide a sudden burst of power for ignition. They’re not made to provide prolonged power for electronics and other devices (that’s what a deep cycle lead acid battery would be for). Using your car battery as a battery that powers electronics, instead of a battery that just gives you a burst of power for ignition, will damage the battery and greatly shorten it’s lifespan if it’s repeatedly used in this fashion. So avoid operating any car accessories or electronics while the car is off. The battery has to be secured at all times. If a battery is jostling around it will be impaired and could short circuit. 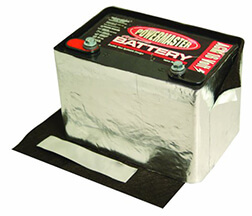 This will ruin the battery – and even cause damage to your car while creating a safety risk. The same could happen if you have bad battery cables (or they’re not connected properly). So check your cables and make sure they have a secure connection as well. 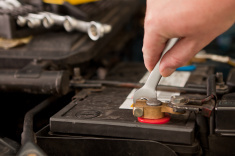 Protecting your car battery from large changes in temperature will help maximize the battery’s lifespan. To do this you can use a car battery insulation kit. Newer model cars already have these kits installed typically. But if your car doesn’t have one, you can easily install one yourself. Just make sure it fits your car’s battery compartment. Generally the companies selling these battery insulation kits will have a form on their website where you can put in your car model and year, and it will tell you if your battery will fit their kit – like here (top of page). These protective battery sleeves are usually made of plastic or an acid resistant, thermal resistant material. These car battery insulation kits will insulate your battery and protect it while still allowing proper ventilation. Your car battery drains even when the car is off. This happens because current is drawn from the battery by car accessories (radio, lights, etc.) or the car computers. This is why people come home from long vacations and find their car battery dead. But to prevent this, you can use either a car battery charger or a solar battery charger. Car battery chargers (regular or solar) will maintain the optimum charge level of your car battery when the car is not in use. They do this by providing enough power for the the car accessories and car computer, so they don’t continuously draw current from the car battery when the car is off. As you can imagine, these chargers are very useful …especially if you go on a trip or leave your car unused for a while. They’re also useful if you go on a lot of short car trips (like to work and back each day) and never give your battery a chance to fully recharge. Repeatedly doing this will dramatically shorten your battery’s life – unless you use a car battery charger or interchange batteries, leaving one at home to fully charge. The most important thing to remember with this tip is …make sure you fully charge your car battery at least once a week because it will greatly increase the life of your battery. Do this with a charger, interchanging batteries …or just going on a car ride long enough to recharge the battery. Most car batteries indicate if there is a need for water. So check the car battery water level indicator regularly and if water is needed, refill the battery with distilled water (and that’s important, ONLY use distilled water to refill your car battery). Never overcharge your car battery. Lead-acid batteries release oxygen and hydrogen gases when they’re overcharged. It also breaks down the composition of the water in the battery – which shortens its lifespan. If you’re doing everything we’ve recommended in this article but your car batteries are still dying early, you’ll want to check your car’s alternator (or get a mechanic to check it). 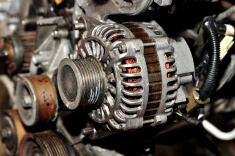 If your alternator is bad it will results in ineffective recharging of your battery and dramatically shorten your battery’s lifespan. 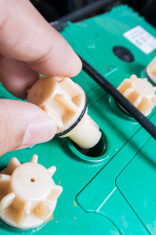 Safety Precaution #1) Before disconnecting your car battery read the car owner’s manual first. Most commonly (if not stated otherwise in the owner’s manual) the negative cable is to be disconnected first and then the positive cable. When you re-connect the battery, connect the positive cable first and then the negative cable. If done in the wrong order it may affect your car’s fuses and other electronics. Also, remove your car keys from the ignition before working on the battery. Some cars are more sensitive to this procedure than others - like German Luxury Cars (Mercedes Benz and BMW type cars) - so use extra caution. Safety Precaution #2) If you are charging a battery do it in a well ventilated area. If you are handling a car battery that is installed you should open the hood of the car for a few minutes to allow for ventilation first. If your car batteries dies or is in the decline phase all hope is not lost! You can still recondition the battery and bring it back to life again. 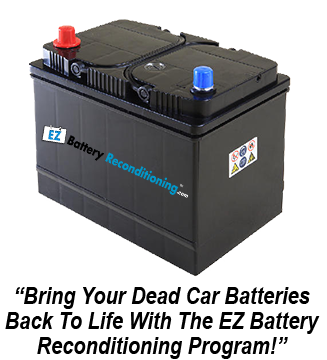 There’s actually a simple method that you can learn in the EZ Battery Reconditioning program that will bring a dead (or dying) 12v lead acid car battery back to life again. …PLUS it will save you money because you can re-use your reconditioned car battery instead of buying a new overpriced battery. Super helpful article. Love your reconditioning course too. Very nice info. Thank you very much. Appreciate this post. ᒪet me try it out. Thanks for the tip on charging your car battery when the car isn’t in use. I didn’t realize that there were chargers available for car batteries! I’m going to be going on a vacation for the holidays, so I’ll get a battery charger to make sure I’m able to start my car when I get back! Wow, so happy I came across this, with these tips am very sure I will be able to make good use of my car battery, before it finally runs out. Thank for writing this. This is very good and informative post. Your course is great also. Looking forward to many more article like this. That’s interesting that your car battery can be drained even when the car is off because the current that is drawn from the battery by the car’s accessories. I’ve heard that the typical car battery should last for about 5-10 years as long as it is properly maintained (or even longer if someone uses your program). I’ll have to remember this great information to make sure I prolong the life of my battery as long as possible. Very helpful article. Thank you very much. Hey Tom, I’m not using these tips on my car batteries. Thanks for helping people save money on batteries. This is great information for maintaining the battery. Also, before you buy a new battery, if at all possible have it filled with acid when you buy. If it’s a maintenance free battery, check the date of “in service sticker” stuck to it. A month or two old is not too bad if it’s been sitting on the shelf that whole time. Longer than that, the sulfate in the battery will fall to the bottom and begin causing problems. So buy new if you can. Also, put it on slow charge until it’s fully charged before you put it into use. Again, great info, guys. Thanks. 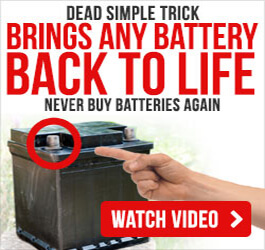 Sign Up Today & Learn How To Revive ANY Dead Cell Phone Battery In 5 Simple Steps ...for FREE!